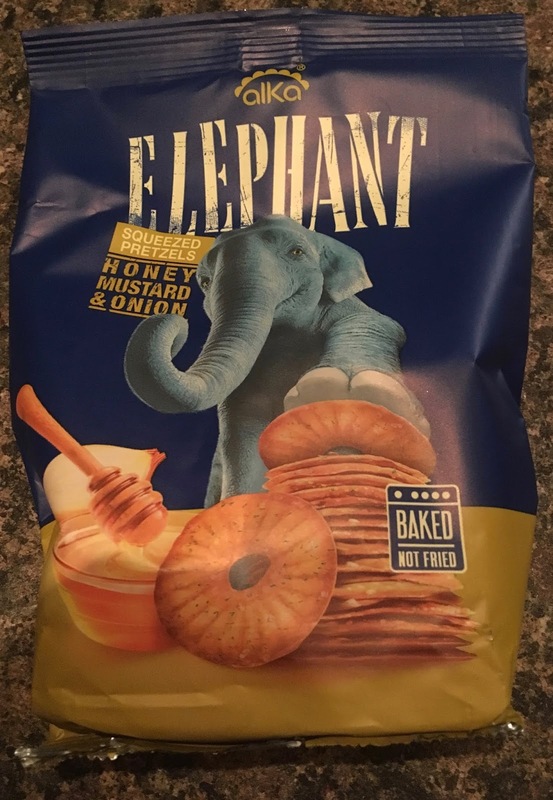 Cinabar recently wrote a blog on the Pizza flavour of these Elephant Squeezed Pretzels. She does like pizza and I remember I enjoyed them too. Innovative Bites very kindly sent us a couple of packets of the Honey Mustard & Onion flavour. Cinabar isn’t that fussed with mustard due to an unfortunate childhood incident involving a large amount of English Mustard, mistaken for German mustard, daubed all over her hotdog. Understandable I guess, but I like all mustards and large amounts of it at a time too. Not to say I’m expecting these Honey Mustard & Onion Squeezed Pretzels to be mustard hot or anything, as anything with the word ‘honey’ in front of it doesn’t point towards nose tingling mustard heat in my mind! These Elephant Honey Mustard & Onion Squeezed Pretzels are baked, not fried, for an added healthy bonus to this alternative snack to crisps or nuts. On opening the packet there was a strong onion smell from the multitude of round thin squeezed pretzel discs inside. From first blast of onion in the taste these Elephant Honey Mustard & Onion Squeezed Pretzels just keep on giving oodles of flavour. And that flavour is onion. If you’re looking for a quick end to your after lunch meeting, which fortunately I was, then these Elephant Honey Mustard & Onion Squeezed Pretzels are for you. There is a hint of sweetness from the honey and an almost imaginable hint from mustard at the back of the flavour, but who am I kidding? 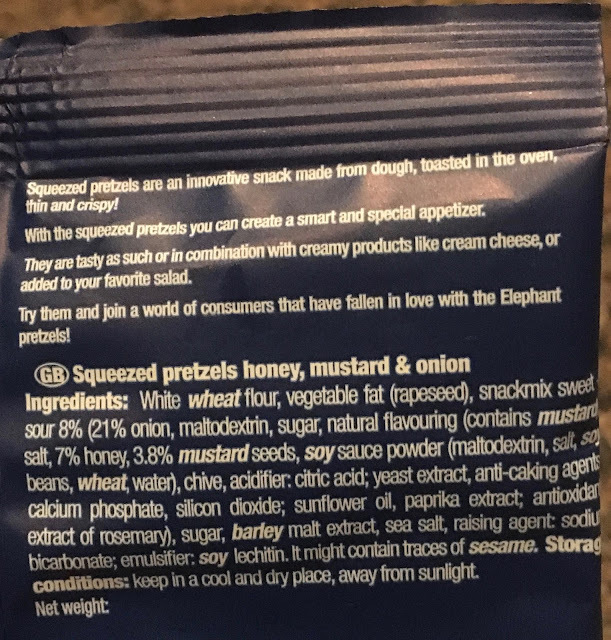 These squeezed pretzels taste of onion. If you like onion flavoured snacks, fortunately like I do, then these Elephant Honey Mustard & Onion Squeezed Pretzels are for you. Just don’t expect a kiss from the missus (Cinabar) afterwards or anybody else in the office either! The 70g packet contains there are 451 calories per 100g, with 16g of fat, 10g of sugar and 2.2g of salt. Please see photograph for ingredients.